TOKYO (Bloomberg) -- Japan banned certain Takata Corp. airbag inflators from future cars and set time frames for the components to be phased out from existing models, taking measures nearly identical to a U.S. regulator’s order one month ago. Automakers won’t be allowed to use Takata airbag inflators with ammonium nitrate propellant in cars under development, Japan’s transport ministry said in a statement issued today in Tokyo. Inflators without a moisture-absorbing substance will be phased out from driver-side airbags by 2017 and passenger-side devices by 2018. The airbag inflator ban and phase-out plan that applies even to models spared from air bags malfunctions follows similar enforcement action one month ago by the U.S.’s National Highway Traffic Safety Administration. 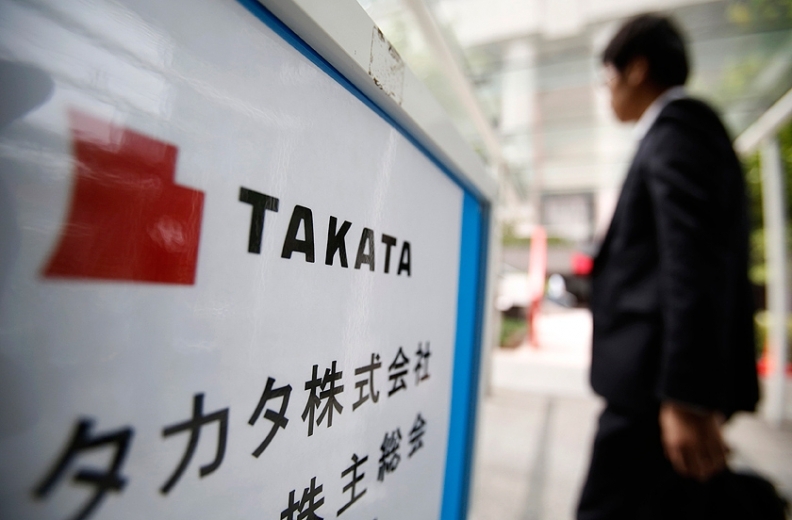 After the agency’s order, carmakers including Honda Motor Co., Toyota Motor Corp. and Nissan Motor Co. said they wouldn’t use Takata’s airbag inflators with ammonium nitrate propellant. “We will make every efforts in our production and distribution of our products to be able to supply replacement parts as soon as possible,” Akiko Watanabe, a Takata spokeswoman, said by phone. The company takes the ministry’s instructions seriously and seeks to restore credibility with automakers, regulators and other stakeholders, she said. In the U.S., NHTSA punished Takata after seven deaths and almost 100 injuries linked to airbag inflators that deployed with too much force and sprayed plastic and metal at vehicle occupants. Automakers have recalled about 19 million vehicles in the U.S. to replace Takata’s inflators. Japan will phase out use of ammonium nitrate airbag inflators without a desiccant, which absorbs moisture, from models that have been involved in accidents in the country by June 2016, the transport ministry said today. In airbag replacements for recalled cars that have been involved in accidents, non-desiccated inflators must be phased out by the end of 2016, Japan’s transport ministry said. As many as 48 percent of recalled vehicles in Japan have had airbag inflators replaced as of the end of September, Masato Sahashi, the transport ministry’s director of recall enforcement, said today at a press conference in Tokyo. CEO Shigehisa Takada acknowledged risk to the company’s survival at a press conference last month after NHTSA’s order. Takata and Honda, its largest customer, lost a bid to toss out a class-action lawsuit this week. Consumers will be able to sue over losses tied to the defect that led to recalls, U.S. District Judge Federico Moreno ruled. Tataka has said it’s aware of the potential for costs related to airbag replacements and lawsuits. The company has put off booking charges until investigations into the root cause of its air bag ruptures are resolved.